Meksikos-Jav siena itin pavojinga, nes čia nereti gaujų susišaudymai, pagrobimai, didelis narkotikų gabenimas, o ir patys policininkai ne angelai. Kirtome sieną ir negavome štampų pasuose, tad keliaujam toliau - kaip nelegalai. | Mexico-USA boarder is very dangerous as here are common gang fights, kidnappings, big drug traffic, while the police is not without a spot. We have crossed the boarder, but without getting an entry stamp on the passports so going now as illigals. 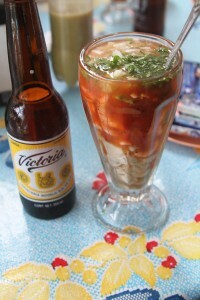 If you have read our last USA adventures, you have probably felt our anxiety before entering Mexico. In our imagination and the people stories ‘There’ sound like a hell, where you would not like to get in. It seemed like narco mafia gangsters and corrupted police like aligators awaiting for you to fill their empty stomacks. ‘Maybe you are not that interesting for big mafia bosses, but there young ones who have relatives belonging to gangs, so they want to show off and might play with the guns. Kidnapping is popular, too’. So we haven’t heard anything nice about the part ‘behind the border’, but we have no choice but cross it. According to travellers advice, we will take a bus to make first 50 kilometres to get out of this inferno part. Maybe the truck would have been an ideal part, but because of the insurance problems they do not take anyone to the cabin. We were not successful crossing commercial border, too. In the early morning we arrive to Laredo on the USA part. The hitched mexican woman warns us to take care. As if we didn’t worry enough. The bridge over the river, the latter one being a popular place to cross illegally, hence the once to succeed are called wetbacks. So on the one side of the river is ‘Hell’ and on the other ‘The Dream Land’. Few people crossing to Mexico, and long qeues to enter USA. To get to Mexico – no passport checking or stamping, and this part gets us into a trouble. After all, without stamps we become illegals in the country. Only some officers try to check our things, but being a bit unsuccessful to repack our backpacks, they let us out quickly. One officer after crossing the border was so amazed seing us, he couldn’t stop admiring ‘I have never seen a person hiking here’. So our first steps into ‘a hell’. It’s early morning. 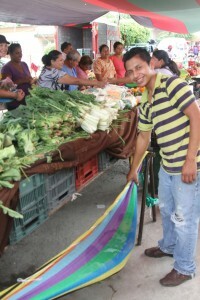 The town is at its usual bussiness – food stores, busy plaza, people chat on the streets. Of course, they are surprised to see us. The last we have experienced such glances was in Indonesia, after that for the 5 months (Australia and USA) were were usuals with bizarre backpacks. It’s not common for gringos (whites) walk here. Normally they take the bus (even that is a rare thing to do) on the USA side and go deep into Mexico. But even then, its not as safe as it might seem. 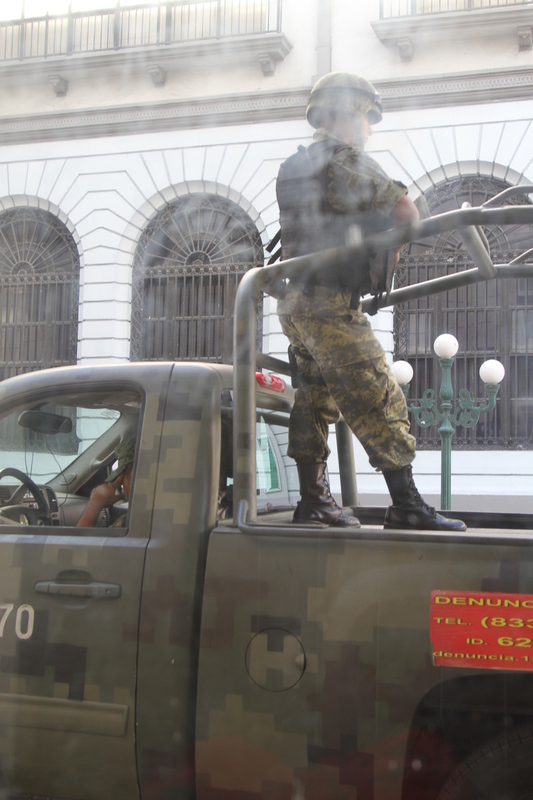 One German guy, whom we met later at our travels, told how he got a bus from the same town Nuevo Laredo, how their bus got stopped by policemen, they pushed their gun to his neck, and all the bus got robbed of their money. One old guy explains us how to get by public transport to the bus station. The crooked bus with lots of religious swinging and glued elements goes to the busy streets. All seems so usual and normal. But we do not try to paint it in pink colours. The evening scenes might look very different, and we reccomend other travelers to take precautions and walk here only in the morning. 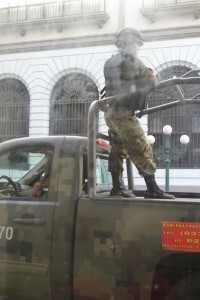 It’s not without a reason, that USA trucks do not enter Mexican part – too many robberies and deaths happened. We successfully get to Monterey, the city among mountains. The inferno belt is crossed, but the locals will constantly warn us of the same: Mexico is not a safe place to be. We approach the policemen within the station. We are hoping they will explain how to get out of the city so we can start hitchhiking. After hearing our story, they all cheerfully promise us to get us free tickets. Meanwhile they share their lunch with us. Later we get to know, that the tickets were from Caritas organisation. Rich people in Mexico donate money, and the Caritas provides free tickets for those unable to travel. In theory, we got an opportunity to travel even further by bus, using Caritas contact, but hitchhiking is so much closer to our hearts. At last we want to use our rusty Spanish and get to know some locals. Plazos - miesto aikštės kuriose verda miesto gyvenimas; čia vyksta koncertai, žmonės rytais mankštinasi, dieną kartu geria kavą, o vakarais susitinka porelės. 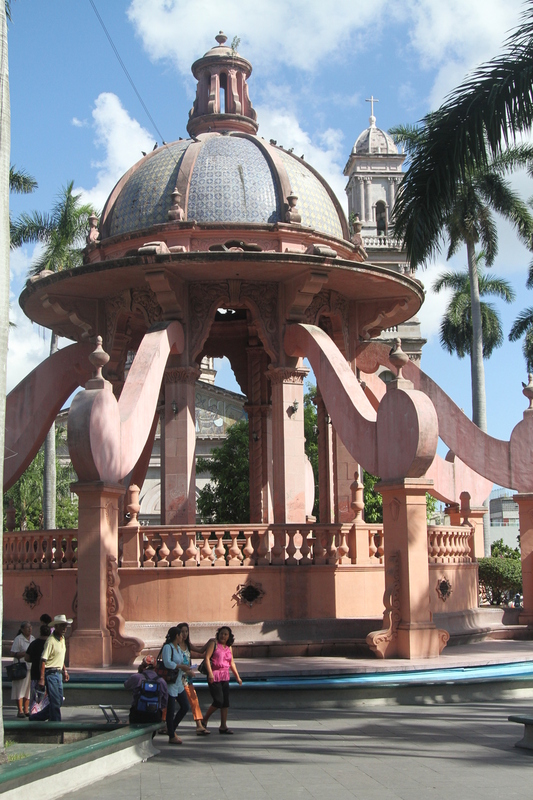 | Plazas - little parks where the city is living to its full. Concerts, couple meetings, morning excersising and so much more life in these little places. We want to know more this little lovely town, so couchsurfing is always an option. To get the night stay at the same day is always risky, as people might need few days in advance, but brothers Ivan and Gerardo were very fast to reply. Already in the evening we taste tequillas and fish in their parents house and we can observe the lovely cosy atmosphere amont the colleagues who gather weekly to have social time together. They laugh at each other innocently, but it seems they are the happiest people on earth. 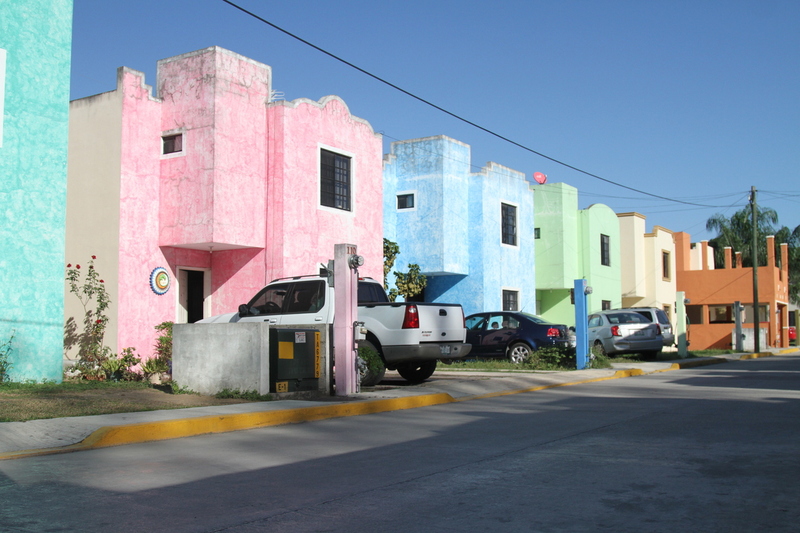 Tampico is a small town, and rarely people would come to visit it, as they would have plenty of other options: Mexico, Oaxaca and others. But we like small towns. The atmosphere so lovely. In the main plaza kids mess around with pigeons, the old observe young couples, while the young ones enjoy the sweet stuff they just bought from the street vendors. In the middle of the plaza there is a place for local bands to perform, so despite it’s a daytime or evening, the life boils there. In the town there is a pond, where the crocodilles flourish. The pond is fenced, so the animals would not curioiusly go walking in the city. 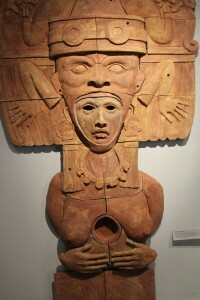 Aztecs is one of the civilizations in Mexico. It covers 6 current regions from Mexico golf to Sierra Madre mountains. 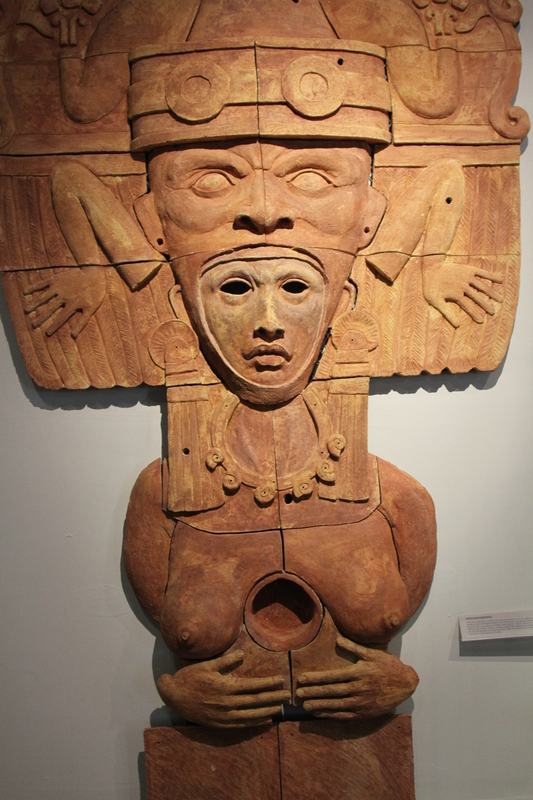 Their religions was based on fertility and three main principles: birth, death and rebirth. Cosmos, according to them, is made of three horizontal plates, communicating among themselves via five trees and one in the middle, which is popular in a sacral life. The sacral dance around it was a common habit. Lots of handcrafts were of religious theme, too. They used lots of make-up and dye their hair. Only the nobles had a right to tattoo or dye their body, sharp their teeth or paint them black. Aztecs unlike Mayans did not have glyphs, but they had a rich oral tradition, and that’s how they communicated their culture and traditions. For example, god Dhipaak, the Corn god, was so popular in myths, because actecs believed that human body is made from corn. Persikėlimas per tiltą yra mokamas toliau esančioje būdelėje, bet kam mokėt, kada gali apvažiuoti? | You have to pay for the bridge crossing, but why paying when you can avoid it? 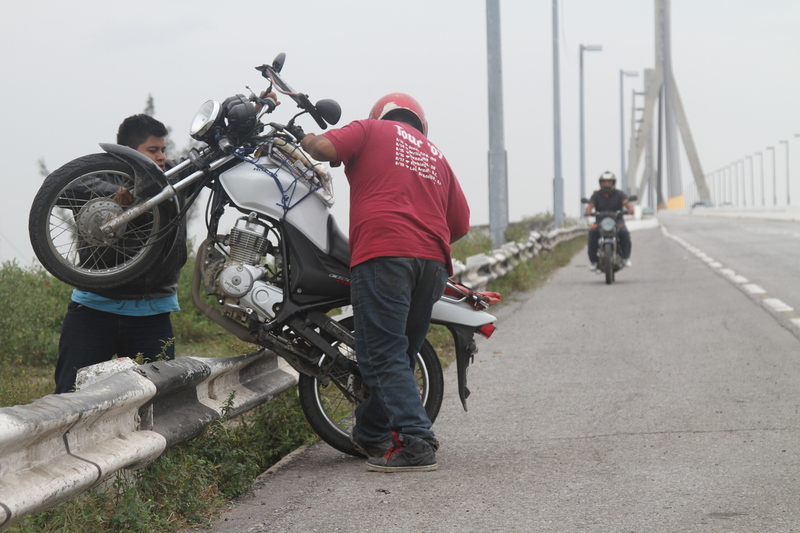 Ivan brings us to the Tampico – Veracruz bridge, which is a paid option, so not many cars passing it. We soon witness a very economic crossing strategy. 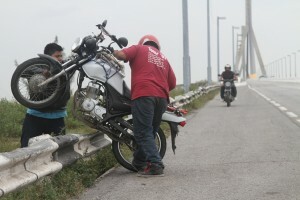 When people going with motorbike come to the end of the bridge, in certain place (far enough from the collecting boot), they take their motorbikes by hand and roll/carry it over to save some pesos. Later we also witness another way of saving up – one car took a really bad countryside bumpy full of potholes road in order to avoid the high taxes. At the beginning it was a bit awkward when he got into the neglected road in the fields, but soon we enjoyed it better than a highway – at least we can see the countryside life closer. It rains heavily. One driver becomes suprised to realise we are planning to camp somewhere in the fields, but when he saw some neglected building in the fields, he gets curious in the process. ‘Maybe there?’ Yeah, soon we get over the fence, which obviously means we are getting into some private area. It rains and getting dark soon, so no other choice. Its a cowshed, after all we realised. But the cement floor and a roof will serve us well as a shed tonight. We inspect the area. In one hole we find five snake skins. Glow-worms are all around us. We don’t even suspect that tomorrow we are going to spend a night near the Gulf of Mexico. The paradox in the traveling still amazes us. The next morning doesn’t promise anything dry. No wish to get out of the dry place, but the cows are approaching, so probably we need to move. The orange tree fields all around. Later an old guy brings us pockets of fruits probably from those fields. It pours heavily. Two genetics professors, who try to improve the corn quality, stop for us as they feel sorry. Normally they wouldn’t take anyone in – such a university policy. With them we start our seafood era. They bring us to one place, where they normally stop to get some shrimp cocktail – amazing thing. They also suggest Chakchalaka beach to stay over, so the next few days we enjoy the emerald water of the golf. Wild dogs look after our tent, but those lovely creatures leave us some gifts – fleas. We get into panick as the traveler forums suggest it will be very hard to get rid of them. We change our plans and go to Veracruz. We don’t want to infect any couchsufers, so we choose cheap hotel instead to make a total wash-up. We do it in a standart tourist way: a hotel (cheap 5 dollar one, but there are beds, even a tv and coffee in the morning), then a walk in the town and museum, and the dinner. But how do the tourist get to know the locals? Where does the adventure lie? We started to long our Road and meeting the local people. We began searching for some things against the flea. Even though we had an exact Spanish word for that, everyone tried to offer us something against louses. You can only imagine what they thought of such ‘tourists’. Next to our and neighbouring hotels you could see some different shape and sized woman in their prolonged eyelashes waiting to ‘offer their services’. We will see such women often on the highway, too. We hitch, and they wait for their clients. Normally truck drivers wouldn’t take us into their trucks due to insurance policies etc., but they would they them for a shorter or longer distance, or just on the spot to implement ‘the thing of great importance’. Of course, our backpacks were not filled of make-up, and the only service we could offer is the our chats in a broken spanish. In Mexico people are afraid. There are lots of vanished people, even more are missing unofficially. Hitchhiking is relatively easy, but it’s hard to hitch a car just before the dusk. So when the sun sets we start searching for a safe place to sleep. If not couchsurfing or guests, we need to find a good spot for pitching a tent. Jungles and some agressive snakes (nauyaca) are not the best option, and some people might be dangerous, too. So we start asking around gas stations, and it worked out very well. When we say that we search for a safe place, both parties understand what we have in mind. It doesn’t cost them anything to provide a two meter spot for us, and for us it is a lot. They have clean toilets, and sometimes showers, too. Maybe, some louder vehicles will disturb your sleep, but after all, it’s a safe place. So you can have assistance in unsafe countries too. As we don’t travel often to touristic places, so not many people would expect to see a gringo in their environment. Gringo (‘green go’ derives from Mexican – USA war times, when USA army wore green uniform). A young family that brought us close to Palenque, pointed some mountains saying the inscription about the remarkable 21 12 2012 date was found there. ‘People think it means the end of the world, but it only tells about the end of era’. After all, everyone who is scared of the end of the world should read more what scientists tell about that. This date only signifies b’a’ktun five millenia era end, but its says nothing of catastrophies, encounter of other planets or new spirituality uprise. 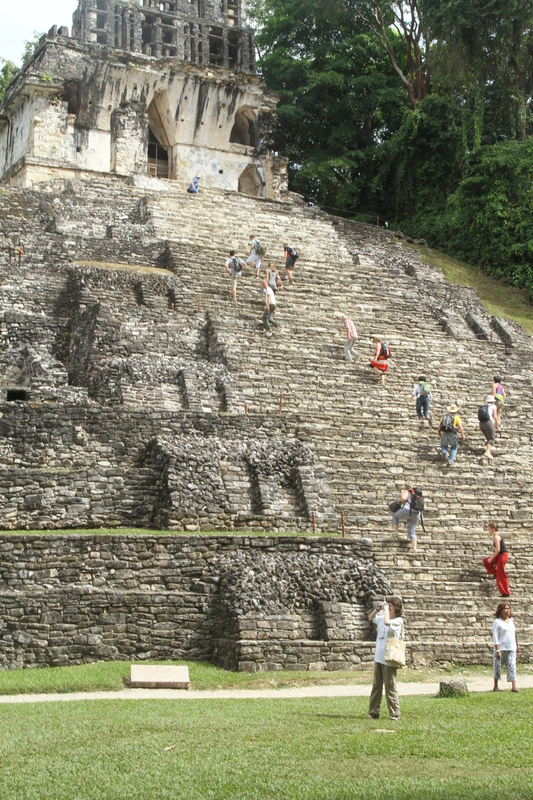 There are lots of upcoming events both in Palenque and other mayan sites to celebrate this date, and there are lots of chats about the ‘end of the world’ around the ruins during this time. Palenque is truly a wonder in a jungle. The temple of Inscriptions and other pyramids stand out among cedar, mahogany and sepodilla trees. There was found a sarcophagus of one of the great leaders Pacal. There are lots of glyphs, which is a well developed and interpreted mayan script, where only nobles were able to use. Tamal - palmės lape įvyniota vištiena su kukurūzų koše. 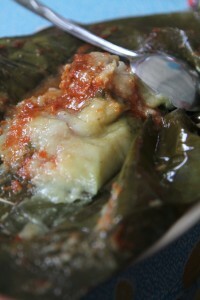 | Tamal - chicken with korns wrapped in a palm leaf. To prepare food on our tiny stove is a waste of time and money when you can find so much cheaper food from street vendors, observe how they prepare it, sit down on white or red plastic chairs and eat the food with the locals. Tacos with some vegetables, which some of them can be so painfully spicy, that you want to cry. Eventually, the pain becomes a pleasure, and the next time you nearly seek that pain again. It’s easy to get used to such flavour. We soon start to use everywhere Ivan’s gift – green chile habanera to spice up all our food. Tamales – corn and chicken meal the cheapest options fill you well. And the diversity of fruits is amazing. One driver treat us with some pineapples and its juice, the softness and sweatness of the fruit gives you shivers. One paradise on earth. No stamping at the USA Mexico border meant trouble to us. We after all, are illegals in the country. After having read lots of forums, we arrive to the immigration office in Veracruz and explain the problem. ‘You are illegals here’. We know it, and we came to solve the problem. The young official hearing we use our broken Spanish didn’t think to slow his tempo or simplify the vocabulary. No chance of getting stamp here, you need to come back to USA (no chance of that, too) or go to Guatemala. The only left option. You can only imagine, how uncomfortable we felt each time being stopped by policemen. Luckily, they never asked our passports. We wanted to sort our dirty things at the border. The smiling officer at the border after getting to know our story repeats the same old stuff we know by heart: ‘You know, you are illegals here’. Really. We give our passports, which are new fresh (we just received them in Lithuanian consulate in Chicago). No stamps. Nothing. We show our old ones to prove we REALLY traveling around the world. He smiles. ‘You will need to pay a…’ he tries to find a right word… ‘fine’ we finish it off. ‘It’s not so fine’ he still smiling plays with the words. We pay 25 dollars each and happy leave the office. 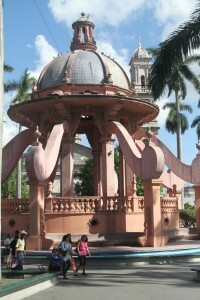 ‘Welcome in Guatemala’. Here we go we coming all very legal.